What is a more disireable mans gift than his very own personlised wheat beer and tankard set? Personalise this Blue Wheat Beer and Tankard Set with a name up to 15 characters to appear in uppercase and a message of up to 3 lines of 25 characters each. The same personalisation will appear on the beer and tankard. Name/Line 1 appears in uppercase. 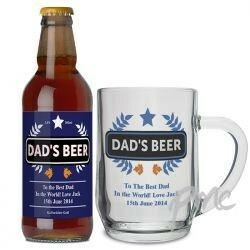 Ideal for New Daddy's, Fathers Day, Birthdays and Christmas.